I’ve always been a fan of veggies on the grill, not as much as meat of course. 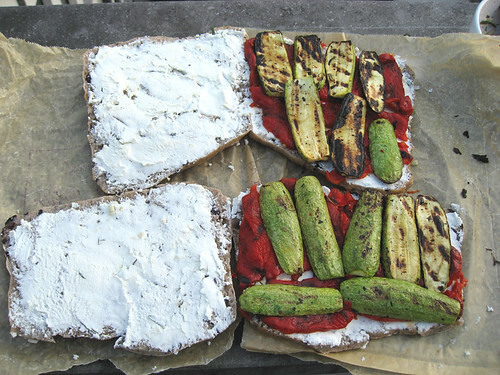 Recently I decided to explore the vegetarian section of the Barbecue Bible. I can assure you this one is a winner. I was able to buy all the ingredients at the Saturday market. Some great olive focaccia from the Spanish stand and really good fresh chevre from the French cheese stand nearby, really made a big difference. I’ve also made it with big loaves of Turkish bread and it turned out very well. The one alteration I have made to the recipe is to crush a couple of handfuls of olives over it just before putting the top on. Really exceptional. I always make enough for a couple of days. It tastes great on day two as well. Brush on any remaining marinade. 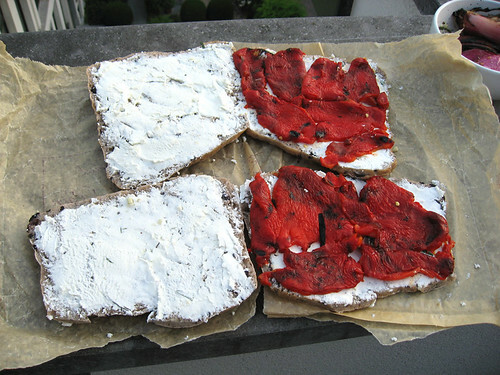 Spread on a thin layer of Goat Cheese on each side (top & bottom) of bread. 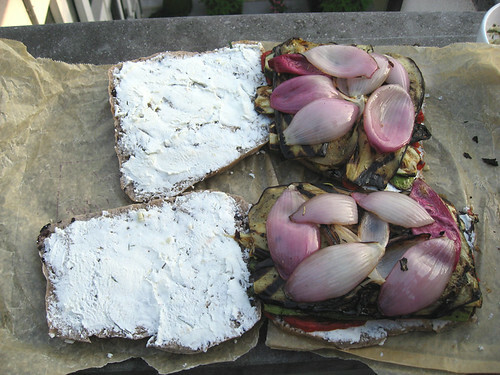 Layer vegetables according to photos. Top with crushed olives and drizzle with Honey. Cut and serve warm or at room temp. I’m so happy to see you highlight grilling without meat and show that it can be delicious, filling and satisfying. I LOVE this post, and the sammich is really crave-worthy! 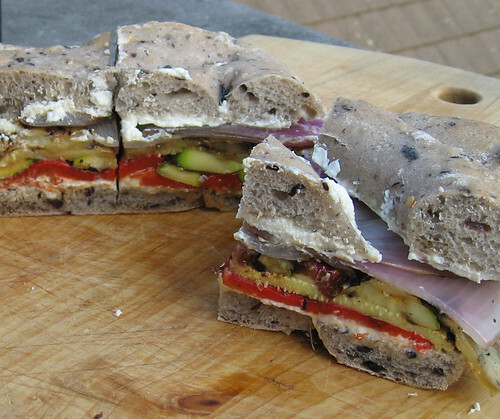 The idea of crushing olives over the top is great – makes me think of muffalettas. I’ll be sure to forward this on to Mickey – because he’s so damn busy – he rarely if EVER checks in here. I’m lucky I even got verbiage for this post – the photos have been in my que fo over two months! And I believe more congrats are in order for making the Top9 twice in one week! Lo and behold, I just happen to have a plethera of egg plant and zucchini coming in from the garden….Hurray! This looks so good! And looking at the ingredients list, I bet it would be great even the next day for lunch, maybe even better. 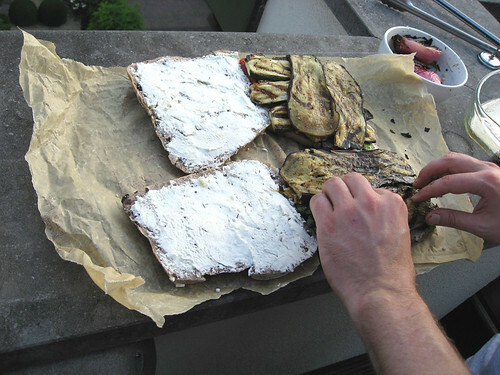 Like those pressed sandwiches. 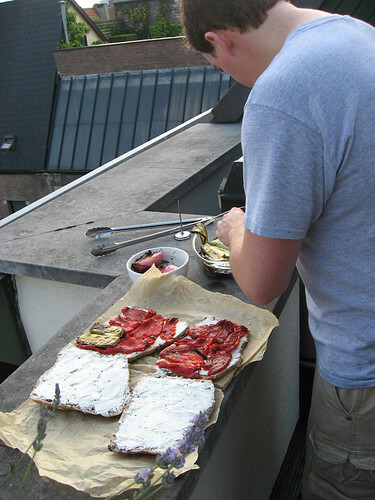 Oooo, I’m makin’ myself hungry! Beautiful! The grilled veggies sound very tempting to me. Adding a handful of olives would add a hit of salt that I love so much. Gorgeous. 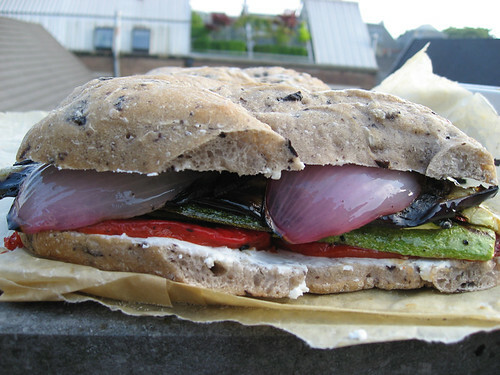 I love this sandwich and with goat cheese, yes I’ll have some right now. Oh MY GOSH this looks phenomenal, delicious, and fabulous !!!!! Grilled vegetables are so good. Can I get one to go please, please, please? yum! 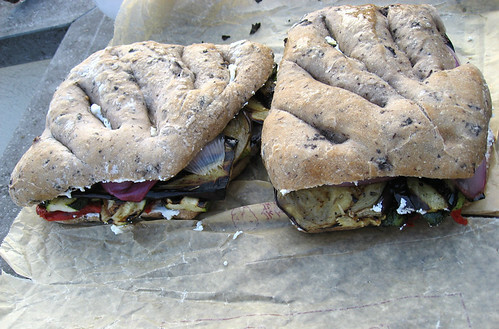 love grilled veggies on sandwiches! This is a great looking sandwich! Thanks for sharing it. I can’t wait to try it. Wow that looks good. I need to try this out. I made this again today. DANG is it ever good!